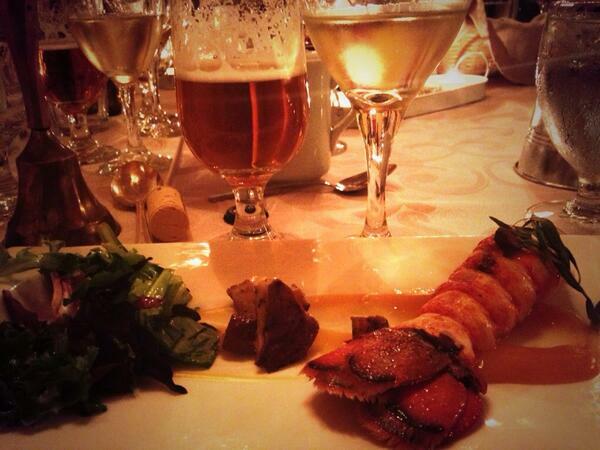 The Halifax Club’s Winemaker vs Brewmaster Dinner featured in my last column was a major success. Lovers of wine or craft beer might like to know what winemaker Simon Rafuse of Blomidon Estates and brewmaster Bobby Zacharias of Propeller Brewing Company selected as their competing pairings for this five course extravaganza. As an aperitif to start the evening off, the contestants chose light and lively to stimulate the palate. Simon Rafuse offered Blomidon’s Tidal Bay 2012, the new Nova Scotia Appellation wine which is a blend of select white wines which are juried before being allowed to bear the Tidal Bay name. 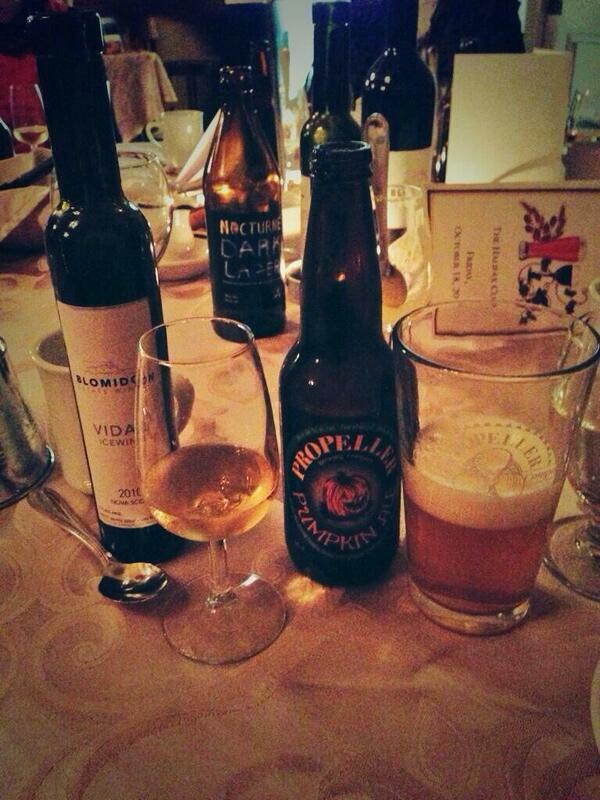 Bobby Zacharias matched it with Propeller’s Honey Wheat Ale – always a favourite with the ladies. 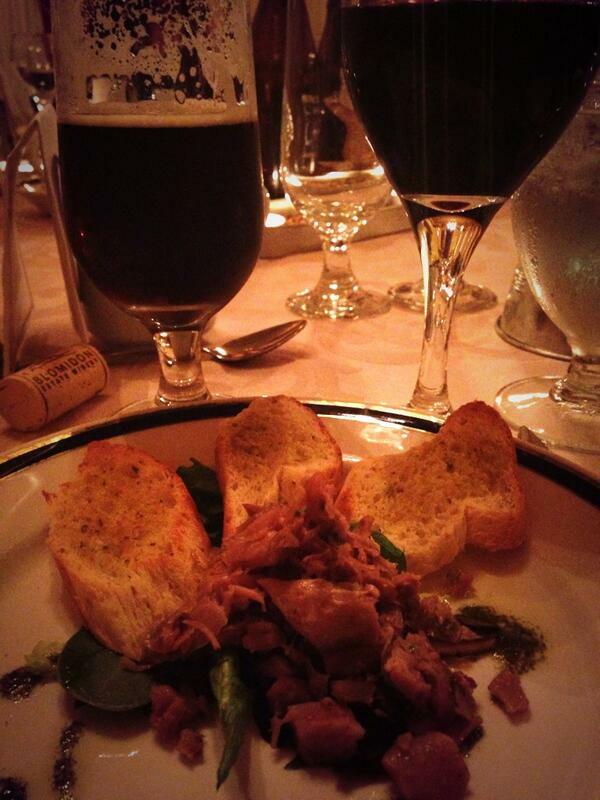 For each course of the meal, the winemaker and the brewmaster explained their choice of a suitable beverage pairing. Guests were invited to vote for the what they considered the better choice with either a wine cork or a beer bottle cap. The second course was vanilla bean butter poached lobster tail with an orange ginger sauce, roasted wild mushrooms and citrus scented baby greens for the fish course. Rafuse responded with his 2010 Chardonnay which had won bronze at the Canadian Wine Awards in 2012 while Zacharias chose the Propeller classic India Pale Ale. Again Blomidon won the round. The third course was a break from rich food and drink with a palate cleanse of Mango Vanilla Bean Ice. Quite probably water was the beverage of choice. Chef Nelson Francis threw down the gauntlet with a complicated fourth course of beef tenderloin stuffed with gorgonzola. Arugula and walnuts with a brandy and green peppercorn demi-glaze coupled with grilled fennel, pollen dusted scallops with white wine and truffle cream sauce. Zacharias chose to cut the richness and complimented the beef with Propeller Extra Special Bitter Ale and Rafuse chose 2011 Ridge Reserve a barrel aged red blend with blueberry and blackberry notes and a spicy vanilla edge. Propeller took this round. This avalanche of flavour was finished of with a brandy snap horn of plenty filled with pumpkin mousse and garnished with fresh berries and caramel sauce. Rafuse used the traditional NS winemaker’s ace up his sleeve with Vidal Icewine but Zacharias countered with a very unique Pumpkin Ale. Propeller won this pairing too. To break the tie all the wine cork and beer cap votes from the entire meal were added up and Blomidon Estate won by 10 corks. Adam Bower, Marketing Director for the Halifax Club said the dinner was a huge success. 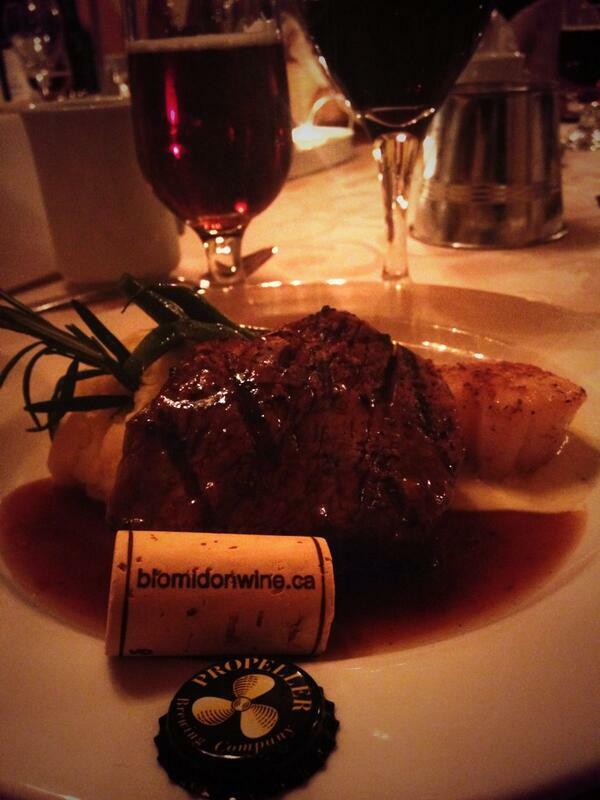 This was the second Winemaker vs Brewmaster dinner the club has hosted this year. The first was in the spring matching Avondale Sky Winery with Garrison Brewing. It also ended in a 2:2 tie with Avondale Sky winning with more corks cast overall as votes. Who will be next twosome up for the challenge?